1) What's you PhpStorm version? 2) If you place your code in brand new empty project -- will it behave the same? 3) Have you tried "File | Invalidate Caches..." ? Thank you - upgrading to the latest version seems to have fixed this issue. Line 30 correctly assigns an ADR object to $ADR and line 45 is meant to assign the CNT object to $ADRCNTID, however it seems as though something is going wrong somewhere here as the CNT object gives no code completion prompts. 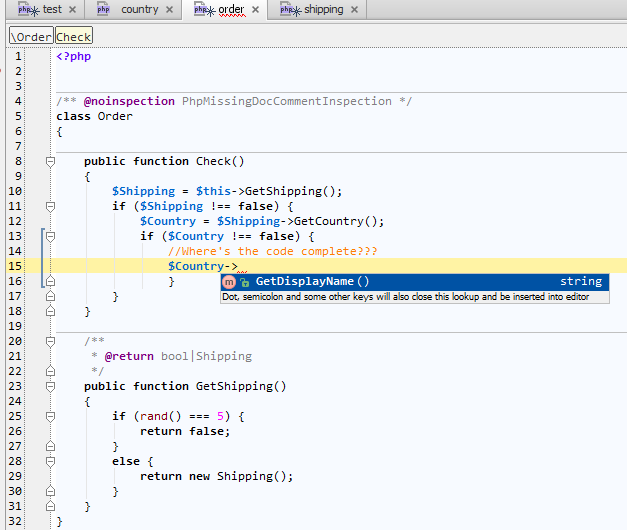 It's a bug in IDE for sure (at least this is how I see it). If I rename your ADR class to ADDR or AADDR -- nothing changes. But if I rename it to CADR or MADR or MADDR -- it works fine. BUT .. if you remove "|bool" from @return ... it magically starts working. It looks like class name that will ALPHABETICALLY go before "bool" (in this particular case) is causing the problem -- IDE looses the class completely.